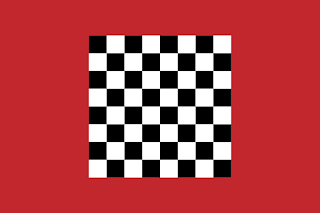 The earliest flag in use in Morocco was a red banner, with a 64-square chessboard design. 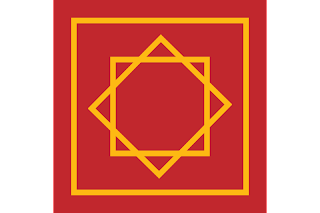 The red is believed to stand for the Fatimids, the black for Abasids, and the white for the Umayyads. Three tribes who established a protectorate over the territories of Kairuan, and Fes. In 1215, the Marinids took control over the territory that lies approximately round the current nation of Morocco, expelling the Berber Almohad Dynasty. They also managed to extend their control over the Straights of Gibraltar, by capturing several cities on the opposite side of the straight, including Gibraltar. The flag of the Marinids was a plain white banner. However, they also took to using a red square, which had a thin gold line running round its edge, and in the centre, an 8 pointed star. These banners where in use from 1215, all the way through to the Saadi Dynasty, ending in 1465.The Alaouite Dynasty that took control, and around 1666, switched the white banner to deep red. The red being a colour synonymous with the descendants of the Prophet Mohammed. 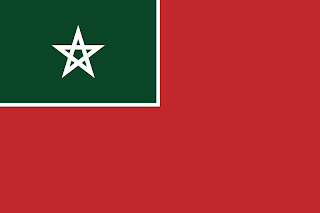 The red banner remained the flag of Morocco up to 1912. 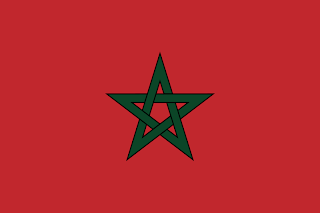 In 1913, with part of Morocco under Spanish control, the flag was altered. With the rise of Communism across Europe, red banners where proliferating all over the world. It was decided to alter Morocco's flag to move it away from such an easy link with a philosophy that Morocco did not agree with. In the upper hoist, they placed a green square, edged in white. In the centre of the square is a white pentangle. Muhammad Abd El-Krim rose to power in the Berber tribes in the Rif region of Morocco, and managed to united the tribes. The Berber tribes had been fighting against the Spanish for very many years, but unable to throw them out, because of their continued failure to work together due to infighting. However, under Muhammad, they finally united, and where able to push Spain out of large parts of their territories. His new republic introduced its new flag. Over the red field was a white diamond, on which was a green crescent and star symbol. The republic, however, was short-lived. Being established in 1921, and collapsing in 1926, under the combined attacks of the French and Spanish. 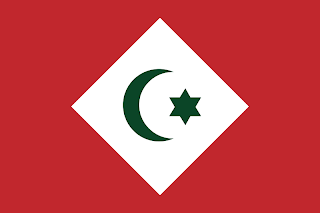 Another flag that had been on the rise from the mid 1800's, took the plain red banner of Morocco, with the addition of a green "Seal of Solomon" 6-point star. Whilst this does have strong links with Judaism as the "Star of David," The six-point star is a symbol of wisdom, health, and long life in all three of the major religions. Then, in 1915, a Royal decree was issued changing the star from 6, to 5 points. The switch now brings the star closer to Morocco's religion of Islam. The 5 points representing the 5 pillars of Islam. 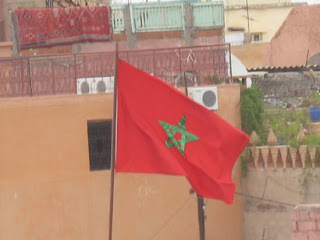 Then, in 1956, with Morocco gaining independence, the red banner with the 5-point interwoven star was adopted as the national flag.